I have a new review for a lip product for you. You might know that I love lip tints and lipsticks and that I have really a lot, but the Banila Co. It Moist Seoul Tint had caught my attention several times before, but I always forgot to buy and try it until it was sent to me by Korean cosmetics online shop Qdepot. Banila Co. first came into my focus when everybody started to rave about their Cleansing Balm. I even bought a couple of samples of it in order to try but I didn’t have the chance to write the reviews yet. Other than that this Korean brand reminds me of benefit when I look at their logo and design of their skincare and makeup products. Also their design is modern and trendy, appealing to young women. What caught my attention in first place was the packaing design. 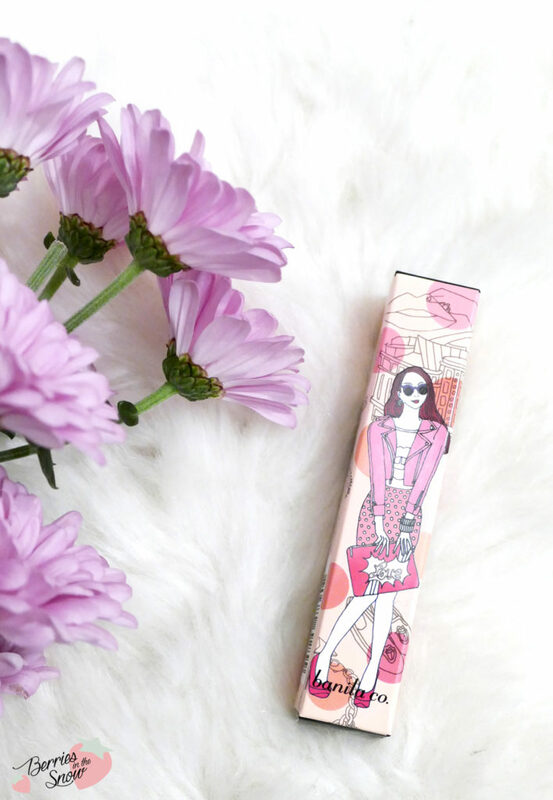 The lip tint comes in a cardboard box with the illustration of a beautiful yound and stylish woman. Banila Co. It Moist Seoul Tint is a mousse type tint providing a velvet finish. There are 5 shades available in total. I selected shade #04 called Beeone, a red peach shade according to the description. The bottle of the tint is quite adoreable. It shows the phrase “I ♥ Seoul”, showing the color of your tint through these letters. The tint comes with a angled brush applicator, that can be easily used to apply the liquid product. It has a thicker texture than a gloss and the term mousse really describes it best, although the finish is appearing moist. It feels velvety on the lips though. If applying a thick layer the product tends to bleed out, so I would recommend this lip tint for a more soft and gradient finish. It is also not transfer-proof and dissapears after eating and drinking, but the color itself is super pretty and it doesn’t feel drying on the lips. The color of the Banila Co. It Moist Seoul Tint is defintely a hit for me. I love the tomato red shade and in my eye the description of a red peach shade can be confusing. I also love the mousse texture of the product. Of corse because it is not long-lasting it is not the perfect tint, but it is good for everyday use and has also a nice packaging design in addition. You can buy the Banila Co. 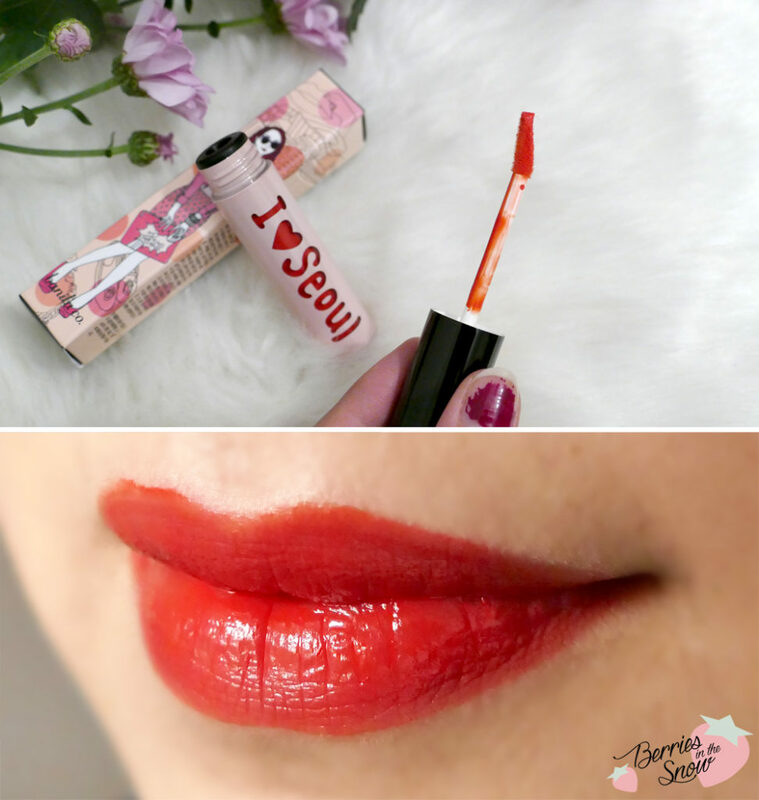 It Moist Seoul Tint from QDepot for 16.35 US$. Q-depot is an online retailer for Korean cosmetics. They have already quite a variety of the most popular Korean brands and they keep adding products frequently. The site is easy to navigate, too. And they offer free samples for each order and free shipping for orders above US$ 49. They are committed to contributing 3% of their group’s net profit for social causes in different countries. So you can shop for your favorite Korean products and do something good, too. Also, Q-depot is having a promotion were you can get 5 US$ off your first order by using the code SW5OFF (orders +50 US$) or 10% off your first order using SW10OFF. Just as a short reminder: All products mentioned and reviewed on this blog are of my personal opinions. This product here was sent to me for reviewing purpose by http://q-depot.com/, which doesn’t influence me in providing my honest opinion on the products. I seriously have fallen in love with the packaging! I’d want a full size poster of it. Shame it does transfer though, I’ll have to keep looking for a tint which doesn’t disappear with the first cup of coffee of the day. I came to know about lip tint while watching dramas.So far I haven’t tried any lip tint but I will give this one a try. Der Rotton ist traumhaft Liebes! Ich liebe ja generell Rot als Lippenstiftfarbe. Damit könnte man mir eine echte Freunde machen.